On Sunday, March 6, 2011, Resurrection Presbyterian Church as "particularized" at a worship service conducted by a commission of Missouri Presbytery. Over 300 people showed their support for Resurrection's ministry by attending the service. Pastor Chris Smith was installed as the Pastor. 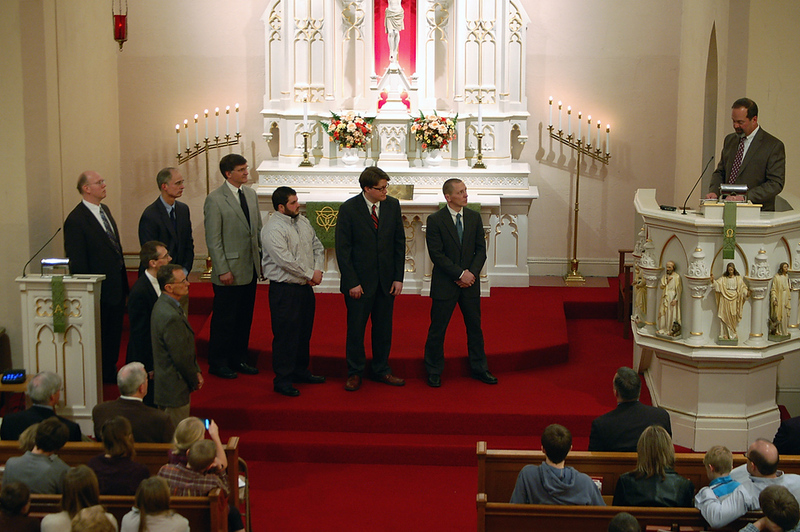 Elders and deacons were ordained and installed. The officers and members of Resurrection were prayed for, charged, and blessed by ministers and elders from Missouri presbytery, the broader PCA, and the Lutheran church! Maybe best of all, after the service we were all treated to an amazing feast, the highlight of which was roast pork cooked by the guys at Iron Barley. The members of Resurrection worked hard to make this a great night. Thank you! You can see more images from the service here.